When it comes to relaxing in a hot tub – everybody loves it. But does it really mean that I have to spend thousands of dollars on a built-in hot tub and hundreds on installation? Definitely no! These are the best cheap inflatable hot tubs in the UK according to our research. They won’t cost you more than a few hundred and will provide endless fun and relaxation. Well, being cheaper means you will miss some premium features like LED lights or saltwater system. While those features are cool, you might save a good amount of money by going with the more affordable options without those perks. 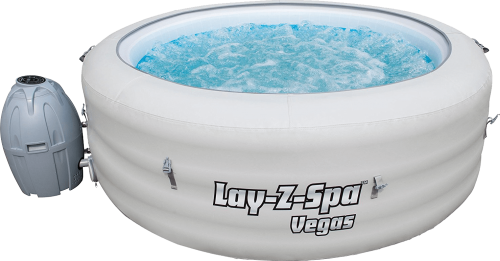 Extremely popular and really cheap hot tub from Lay-Z-Spa. It seats up to four people and heats up to 40°C. Water capacity is around 800 liters. Setup is super easy, no plumbing or wiring necessary. Just plug it into ordinary electrical socket, fill it with water, and you are good to go. 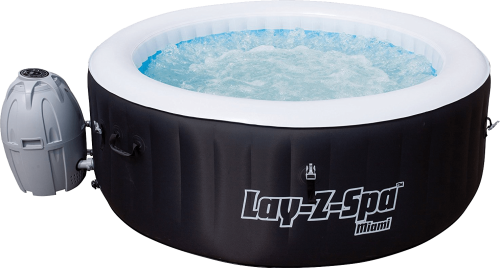 Lay-Z-Spa Miami also has an insulated cover for reducing heat losses and improving safety. 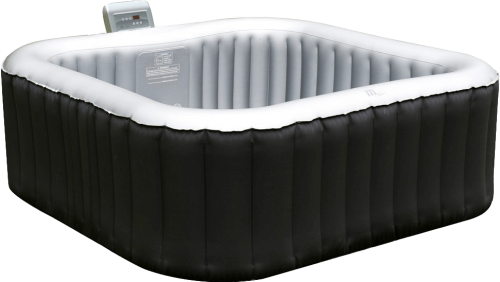 It’s one of the most affordable inflatable hot tubs on the market in UK right now! High-quality hot tub for up to four people featuring rapid heating and water filtration system. How do I change the water temperature or turn the bubbles on and off? It’s very simple. Lay-Z-Spa Vegas uses an easy-to-use digital control panel placed on top of the heater unit. A cover is included for reduction in electric consumption when the hot tub is not in use. Setup is very easy, just follow step by step instructions provided on the DVD. A cheap inflatable hot tub with 108 massaging air jets. It is designed to fit 2-4 people. Mspa Alpine can be easily installed without any special tools. This one heats up to 43°C thanks to PTC heating technology. The heater and air blower unit is built-in in the wall of the spa. This makes it very compact and easy to place or store! Don’t forget to check out our best inflatable hot tub list, some of the hot tubs there might cost a little more than the ones listed on this page, but they are worth checking out! What are the advantages of buying a cheaper hot tub? Imagine if you decide to get a built-in acrylic hot tub. It will cost you thousands (!) of dollars + costs of plumber and electrician. Built-in hot tub price can easily get to 10,000$. Then there are acrylic standalone hot tubs, these are definitely more affordable than built in, but they still cost thousands. What if you can get all this relaxation in a few hundred? That’s what cheap inflatable hot tubs are for. In a few hundred bucks, you get a heater and an inflatable spa (which is much stronger than you would expect from an inflatable). What’s the best about this? No need for plumber or electrician. Those hot tubs run from an ordinary 110v socket and are filled using an ordinary water hose. How easier than this can it get? Costs of repair are another part where cheap hot tubs win. You can easily get an inflatable hot tub for 350$, that might as well be a price of repair for some problem on a built-in spa. Do they have any special features? You would be amazed how luxurious these blow-up hot tubs are. While most of them have air jets (which some people prefer), some of them have real water jets just like their expensive counterparts use to have.